The Mayoko-Moussondji Iron Project is in close proximity to existing transport infrastructure including a heavy haulage railway line which intersects the project and connects to the deep water port facility at Pointe-Noire. Equatorial has established a major competitive advantage by negotiating significant access agreements with the key transport infrastructure partners in ROC. The Mayoko to Pointe-Noire railway line was originally designed and operated by COMILOG for the heavy haulage of manganese ore. Recent preliminary studies have confirmed 10 million tonnes per annum of available capacity on the railway line. In September 2010 Equatorial signed an agreement ("Protocol D'Accord") with the state-owned and operated railway company Chemin de Fer Congo-Ocean ("CFCO") which granted Equatorial immediate access to the railway line. Equatorial is now a regular user of the line, transporting fuel, consumables and heavy equipment between its exploration base at Mayoko-Moussondji and the port of Pointe-Noire. Equatorial plans to complete a detailed Railway Feasibility Study during 2012 which will provide the parameters of a Tariff Agreement between the CFCO and Equatorial for potential future commercial transport. 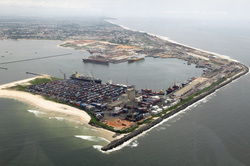 The deep water port at Pointe-Noire is one of the largest and deepest ports in West Africa and is a vital communication axis in equatorial Africa, serving the entire Congo basin including the Democratic Republic of Congo (DRC), Central African Republic and northern Angola. The port is capable of berthing Panamax sized vessels and is a regional centre for container traffic with bulk materials handling facilities and a logistics centre for offshore oil exploration. In early 2011 Equatorial signed a Memorandum of Understanding ("Protocole d'Accord") with the Port Authority of Pointe-Noire ("PAPN") in which Equatorial and PAPN undertook to cooperate in investigating and implementing bulk export facilities from the port of Pointe-Noire. Under the terms of the agreement, Equatorial appointed port engineering specialists Murray & Roberts Marine and Demcotech to work with the PAPN to complete an initial feasibility study. The Company intends to finalise the initial study and commence immediately with further negotiations and more detailed feasibility work in relation to the preferred export solutions.